Despite the unusual addition of pumpkin to these cookies, they were all either eaten or allocated so quickly that I'm going to have to make a second batch so that there are some for me to eat, too. I bought the cheapest bike that I could find the other day. Yes, it's rusty, and no, I probably shouldn't ride it from John O'Groats to Land's End any time soon, but it'll take me on the 3 mile round trip to Uni and back when I'm in a hurry and will give me an excuse to check out the infamous Jesmond Dene in Newcastle, which I have heard many things about but have never been able to find. Unfortunately I didn't notice that the handlebars were too low until I had left the shop, so I had to buy myself a spanner to loosen the knut(?) that secured them. Despite the nicely toned arm muscles I achieved from lifting heavy trays in the restaurant all summer, I still lacked the body strength to loosen the knut. Fotunately, my house is opposite a garage, so I popped my head round the door, batted my eyelashes and asked for some help. To my embarrassment, the mechanic managed to loosen the knut within all of thirty seconds. Oh dear. I promised him cookies for his troubles, so three of the cookies are allocated to the mechanics at the garage. Another four cookies have been allocated to N, my ex-housemate, to whom I promised the occasional bake since he was always my most enthusiastic cake-eating fan. I went over to hang out with six of my male friends who rent a flat together, and left the box of cookies on the sofa while I briefly went upstairs. Five minutes later, I returned to the box to find that all but two of them had been scarfed on the spot. So that left two cookies for me, then. I'll definitely have to make some more. These cookies are just what I wanted: extremely chocolatey with a bit of an unusual twist. If you're not afraid of trying unusual flavour combinations, these might just be for you. Preheat the oven to 190C/170C fan and line two baking trays with parchment paper. Stir in the flour and baking powder until the mixture is smooth. Finely chop the chocolate and stir it into the cookie dough with the grated pumpkin. Bake in the oven for 12 minutes, or until they have set. Leave to cool on a wire rack, then store in an airtight container. 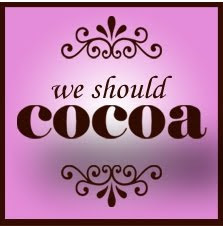 This month's We Should Cocoa (started by Chocolate Log Blog and Chocolate Teapot) is being hosted by Nat at HunryHinny, with the theme of pumpkin. I think these fit in nicely so I'm using them as my entry. This month's One Ingredient Challenge also happens to be for squash or pumpkin, so I can enter these cookies into that as well! It's hosted by Nazima at Franglais Kitchen (and Working London Mummy) this month, and was started jointly with Laura at How To Cook Good Food. This weekend I'm planning on either rainbow cupcakes or something for my Baking With Spirit entry. Stay tuned to find out what I choose! What a great pumpkin and chocolate cookie. I know I would be happy to make up a few batches of these over the next week or two. A nice easy to prepare recipe with a perfect looking cookie! Let me know how they go if you make them!